2018 has been a year of milestones in the world of land sciences at WIT. The milestones marked at WIT this year include 40 years of collaboration with Teagasc and 20 years of Forestry education, as well as playing a major part in the €20m EU-funded SmartAgriHibs project. 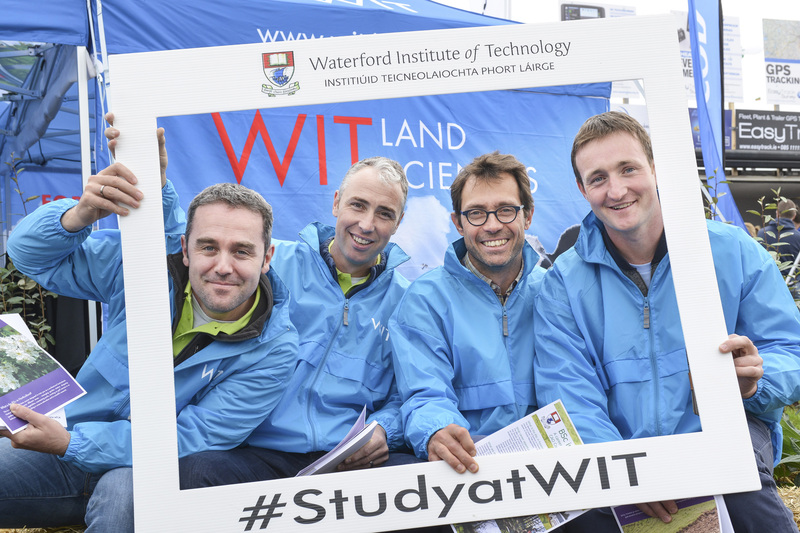 Academics from WIT will be on-hand at the National Ploughing Championships 2018 ( Block 4 - Row 14 - Stand 302) to talk course options to prospective students (or their parents) and chat about their area of expertise and research interests. WIT experts in smart-agri will be on hand in other locations. In addition to members of WIT’s schools outreach team who are available to give an overview of all courses, there will be a strong presence from the institute’s popular Department of Science. WIT offers a number of land sciences degrees: Agriculture, Agricultural Science, Horticulture, Forestry, as well as Food Science. As regards the milestones, the annual Land Sciences Careers Day in March again proved a success – the event availed of the WIT Arena’s conferencing facilities and gave final year students the chance to meet with 45 Agriculture/Agri Food Processing/Horticulture/Forestry companies, and listen to talks. The commemoration of 40 years between WIT and Teagasc collaboration in education provision was marked at the Land Sciences Careers Day. Teagasc’s Prof Gerry Boyle gave the keynote address on the day, and in his speech he spoke about the fruitful and positive relationship that has existed for 40 years between the two organisations. WIT was the first third level organisation that Teagasc collaborated with 40 years ago, with WIT Agricultural Science students being taught some of their modules in Kildalton Agricultural College. WIT and Teagasc have recently signed a Memorandum of Understanding, and based on this document and the ongoing collaborations and linkages that exist, the relationship between the organisations looks set to last long into the future. Another milestone for the institute is that in the past year WIT has celebrated 20 years of Forestry education with a new online forestry hub at www.wit.ie/forestry20years. Since 1997 WIT has been preparing foresters for a professional career in forest management with the BSc in Forestry. WIT also offers the add-on course BSc (Hons) in Land Management in Forestry which combines the invaluable expertise of both the School of Science and School of Business. The institute’s reputation in the agricultural sector – specifically the future of smart-agri was recognised when WIT was announced earlier this summer as Ireland/UK co-ordinator – one of nine across Europe – for the €20m EU-wide SmartAgriHubs project. As the co-ordinator for the UK and Ireland regional cluster WIT, which has developed smart agri expertise through its Telecommunications Software & Systems Group (TSSG) research centre, will be the central point of contact for farmers, advisors, ag tech and agri-food companies who want to avail of technology solutions from across Europe to farming and business problems. Denise Manton, Technology Gateway Manager in TSSG, will be attending the Ploughing on Tuesday and will be available to answer any questions on SmartAgriHubs. TSSG will be in the Enterprise Ireland tent with the Technology Gateway Clusters – Applied IoT, EMD, Irish Food Tech. TSSG will also be in the Innovation Arena with National College of Art & Design (NCAD) to discuss the Microfarm project we are collaborating on. Nithin Padmaprabhu, an Experienced Software Developer in TSSG, is working on Microfarm and will be available across the 3 days to explain the project and answer questions.